The Field: The Goal Cage is 6’ by 6’. The circle around the goal is 8.5’ in diameter and is called the Crease. Field players must treat this line as a cylinder and cannot break the plane of this cylinder with their bodies or sticks. The goalie is allowed to cover the ball when the ball is inside the crease. If the goalie leaves the crease with the ball in her stick, she may not step back in while still in possession. If the goalie leaves the crease a field player may go into the crease and take her place if her team is in possession of the ball. This deputy (the unpadded field player’s new name in goal) is not allowed to block shots. The other lines around the goal are known as the 12-Meter Fan and the 8-Meter Arc. The Center Circle is used for the draw, which happens after every goal and is done in a standing position with the ball placed between the backside of the two players’ sticks. Restraining Lines are lines at either end of the field that are used to control the number of players on offense or defense at any one time. See Players and Positions for more information. Players and Positions: There are 11 field players plus a goalie for each team. The lines on either side of the centerline are called restraining lines. Only seven field players from each team are allowed into the offensive side of their restraining line. This prevents congestion in front of the goal. Four "attack" players, have roles that are primarily offensive; shooting on goal and feeding cutters. They will typically stay behind their opponents restraining line. Three mid-field players, "middies," are counted on to play equal parts offense and defense and they run the length of the field. Four "defense" players are defensive specialists. They tend to stay behind the restraining line when the ball is on offense. Four players (plus the goalie) must remain on the offensive or defensive side of the restraining line at all times thereby limiting the number of attackers or defenders. If those players cross the line, they are considered offsides and a penalty is given. Equipment: The ball is slightly smaller than a tennis ball and made of dense rubber. Sticks are between 35-1/2” to 43-1/4” long. The pocket is considered legal if the top of the ball is even with or above the sidewalls of the stick head when dropped into the pocket and slight pressure is applied. Mouth guards and eye protection are mandatory. Goalies wear a helmet with throat guard, gloves, and chest protector. (Many elect to wear additional protection). Evolution of Women's Lacrosse Rules: The women's lacrosse game has been modified significantly over the past ten years. Modifications include limiting the amount of players allowed between the two restraining lines on the draw to five players per team. Stick modifications have lead to offset heads, which allow the women's game to move faster and makes stick moves and tricks easier. In 2002, goggles became mandatory equipment in the United States (but not a requirement in international rules). In 2006, hard boundaries were adopted. Women's vs Men's Rules: The rules of women's lacrosse differ significantly from men's lacrosse and are specifically designed to allow less physical contact between players. As a result of the lack of contact, the only protective equipment required is eyewear and a mouthguard. Although these are the only protective equipment, there are still many injuries due to accidental checks to the head. The pockets of women's sticks are shallower than those of the men, making the ball harder to catch and more difficult to shoot at high speed. Checking is different from men's lacrosse. See the detailed description below for more information. Finally, In women's lacrosse, players are not allowed to touch the ball with their body or cover the ball with their stick in order to scoop it into their stick or protect the ball from picked up by an opponent. Cradling: View teaching points and video links. Some cradling violations include: Covering - a player may not guard the ball with her foot or stick. Warding Off - cradling with one hand and using the other arm to ward off the defender. Illegal cradle - players cannot cradle too close to their head or body so as to make an otherwise legal check impossible. Checking/Modified Checking: Checking is the striking of an opponent’s stick head in an effort to dislodge the ball. Stick checks should be controlled, short, quick taps. There should not be a backswing. A defender may never check toward the head or body. Players may only check using the side of their stick. Using the flat of the head, is called a "held check," is a foul and the opposing team will get the ball. When playing with modified checking or no checking the 3 second rule may apply. This means that if a defender is closely guarding the attacker who has possession of the ball for more than 3 seconds and the attacker does not make an attempt to switch hands, dodge, etc. the ref may award the ball to the defender. ​It should be noted that stick-to-stick contact is not necessarily a violation of the no checking/modified checking rule. A defender who is holding her stick in good defensive position may force the attack player to cradle into her stick causing contact. This is not considered a stick check, as the attack player initiated the contact, not the defender. A similar situation would exist when the defender puts her stick up in an attempt to block or intercept a pass and the attacker makes contact while in the act of passing or catching the ball. Some common checking violations include: check to the head (all checks must be made away from the body), slash, dangerous follow through of check, dangerous contact, reach across the body, modified checking violation (ex: check above the shoulders when not playing with full checking) and checking an empty stick. Ground Ball: One of the most important skills - as the girls are developing their skills the ball often ends up on the ground. Often times games are lost because of loss of possession and a team’s inability to win ground ball to regain possession. View video link. A player may not cover the ball when picking up a ground ball. A player may not “hold” another player’s stick down to prevent them from getting a ground ball. Defense: The goal of the defender is to be able to direct the attacker where they want them to go and to get them to turnover the ball. View video link. Length of Game: Women's games are played in two 25-minute halves. These 25 minutes are running time, except for after a goal is scored and on any whistle within the last two minutes of each half. While the whistle is blown, players are not allowed to move. In high school and middle school: If a team has a four-goal advantage the clock will run after goals. Center Draw: The draw takes place at midfield to start each half and after every goal. The draw is a chance to gain possession. View video link. The ball must go higher than the midfielder’s head or else there is a redraw. Besides the players conducting the draw, 4 players from either team may stand on the edge of the circle. The other players must be behind their respective restraining lines. 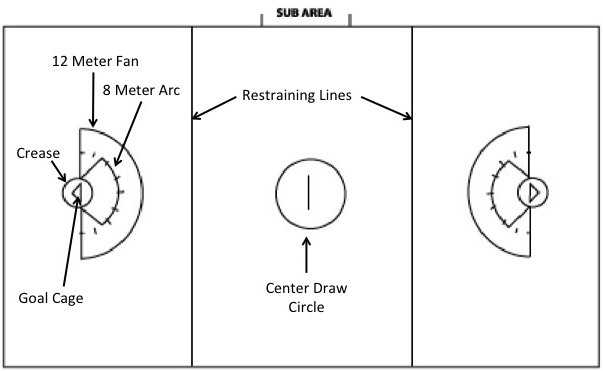 Players may move before the whistle but must remain outside the circle or behind the restraining line. A team with a 4 goal or more deficit may choose to take indirect free position at the center of the field in lieu of a draw. The opposing center must be 4 meters away at a 45° angle. The center with the ball may not score without first passing the ball. Out of Bounds: When a player with the ball steps outside the line while in possession of the ball, the ref will whistle and award possession to the opposing team. When a ball goes out of bounds, the team who was last to touch the ball loses possession of the ball. When a shot on goal goes out of bounds, the player closest to the ball when it crosses the boundary line will gain possession 2 meters inside the line. Fouls: There are two types of fouls: Major and Minor. Major fouls usually pertain to offenses that are potentially dangerous. Minor fouls are less series such as checking an empty stick, covering a ground ball with a stick, or guarding the ball with ones feet. A Major Foul committed outside the 8-meter arc: For a major foul by a defender, the free position will be at the spot of the most recent foul. All players are cleared from the penalty lane. A Major Foul committed inside the 8-meter arc: All players’ bodies and sticks must be cleared from the arc and penalty lane. Player with the ball may have her crosse in the arc, her feet must be behind the arc. The goalkeeper may return to the goal circle as long as they did not commit the foul. All players must take the shortest route out. The player who was fouled will move to a hash mark on the 8-meter nearest to the spot of the foul. The player who fouled moves to the 12 meter fan directly behind the player taking the free position. For Minor Fouls: The player committing the foul must move 4 meters behind the player getting the free position. Goal Crease violation: A player (other than the goalie) may not enter the goal crease with any part of their body or stick. If a player’s stick crosses the crease after a goal, the goal will not count. The goalkeeper may reach her stick out of her goal to bring the ball back as long as no part of her body is “grounded” outside the goal circle. She may also cover the ball to bring it into her stick as long as no opponent is in a position to play the ball. The goalkeeper MAY NOT bring the ball back into the crease if they had to leave the crease to get the ball. Three Second Violation: A player (either attack or defense) may not stand within the 8 meter arc for more than 3 seconds. Shooting Space violation: One of the most difficult to understand, this rule is for the safety of the players. In order to avoid being called for a shooting space violation a defender must be within a stick’s length (with no arm extension) from the offensive player. View video. The green card, given to the team captain, is for a delay of game. The yellow card is for a first-time penalty and results in the player being removed from the field for five minutes (three minutes in high school competition). The team whose player gets the card must play with one less player until the penalty is over. A yellow card may also be given if a player has been warned by a ref but continues to commit the same foul. The red card is the result either of two yellow cards or one unsportsmanlike behavior ruling, and causes the player to be ejected from the game. If the red card is for unsportsmanlike behavior, the player is also not permitted to play in the following game. Stand on Whistle: All players must stop and stand still when the whistle blows to stop play. A player moving after the whistle can be called for a foul and change of possession awarded. Substitution: Is unlimited and may occur at any time. Substitutions must check in at the scorer/timer table and enter the field through the team substitution area. The player coming off the field must completely exit the field before her substitute may run onto the field. Uslacrosse.org is a great resource to find helpful information. The youth handbook can be found at the following link and you will receive one from US Lacrosse each year.